Does your iPad Mini 2 battery is not lasting as long as you need? 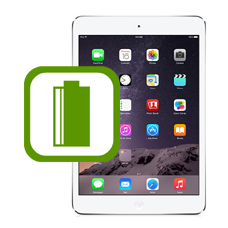 Has the iPad Mini 2 been left uncharged for a long period of time and no matter how much you charge the iPad Mini 2 battery it will not fully charge or still shows the flat battery icon?If this is the case allow our expert technicians to fit a genuine Apple iPad Mini 2 battery to your unit, the battery will be fully tested with a complete charge cycle, then return shipped back to you using our insured express delivery service. * Our normal repair turnaround times are 3 - 5 working days. We always aim to complete repairs as fast as possible. This is an in-house Apple iPad Mini 2 repair service, when ordering this service you are required to ship your iPad into our repair centre for works to be undertaken.